Next week's changes in Northern Ireland are the end of the UK Digital Switchover. On the same day Analogue Switch-Off happens in the Republic of Ireland. The Saorview (Irish for "Freeview") service has been running for some years now, and 24th October 2012 marks the day in the Republic of Ireland where the old VHF and UHF analogue television services are discontinued. You can see full interactive maps of Saorview at Saorview (and relays). In addition, there will be a small number of changes to power levels and frequencies for Saorview. 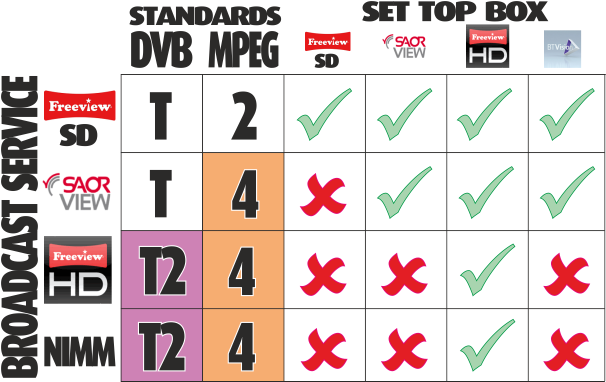 From Technical Parameters - ComReg and http://www.rtenl.ie/wp-content/uploads/2012/10/SAORVIEW-Frequencies-Rev-2.4.pdf. hi i have lost my uk channels i still have my irish channels i had the uk channels but now they are gone what can i do. Daniel Robinson: Carnmoney Hill is a lite transmitter and broadcasts all of the BBC channels which are funded by your licence fee. The TV licence is not a subscription and does not entitle you to receive any particular channels (its a licence for using television receiving equipment in your home). The channels you refer to are operated by commercial broadcasters who are mainly interested in making their channels available to the highest number of viewers, in order to sell advertising. It would be too expensive for the commercial broadcasters to make their channels available from lite transmitter (such as Carnmoney Hill). Some of the area served by Carnmoney Hill can also receive the main transmitter at Divis, so put your postcode in to this website to see whether you could change your aerial and receive the full range of channels. You could also look at getting Freesat.